LST-854 was laid down on 30 August 1944 at Seneca, III., by the Chicago Bridge & Iron Co.; launched on 20 November 1944; sponsored by Mrs. M. A. Menkol; and commissioned on 14 December 1944, Lt. E. J. Robeson in command. During World War II, LST-854 was assigned to the Asiatic-Pacific theater and participated in the assault and occupation of Okinawa Gunto from April through June 1945. Following the war, the ship performed occupation duty in the Far East and saw service in China until early March 1949. She was decommissioned on 21 October 1949 and was recommissioned on 20 November 1950 and performed extensive service during the Korean War. On 1 July 1955, she was redesignated Kemper County (LST-854) (g.v.) after a county in Mississippi. Continuing operations with the Pacific Fleet following the war, Kemper County participated in the support of the Republic of Vietnam commencing in 1965 until she was decommissioned once again on 28 May 1969. 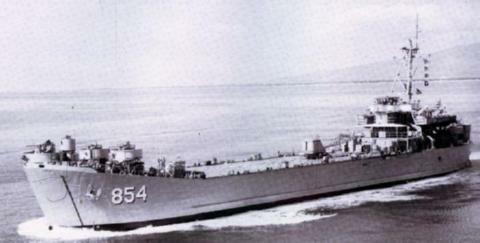 LST-854 earned one battle star for World War II service, five for the Korean War, and one award of the Navy Unit Commendation and five battle stars for the Vietnam War.